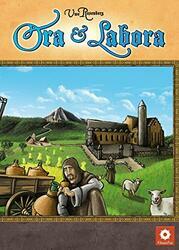 From Agricola and Le Havre, each of Uwe Rosenberg's outings is eagerly awaited ... Ora & Labora will transport you to the countryside of Europe where you will discover all the subtleties of the monastic economy. In this development game, the basic principle is that the player is at the head of a monastery and must win territories and build buildings that become small businesses that will generate resources and profits. Offering two game modes (France or Ireland) and a rich amalgam of mechanisms, including the ingenious production wheel, Ora & Labora can be played in short or long version, from 1 to 4 players. Thanks to the cards that can be used on both sides, Ora & Labora is highly replayable.